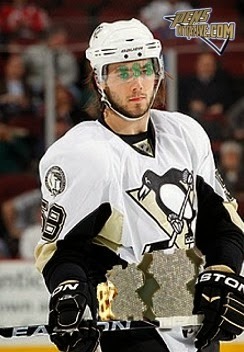 Penguin’s defenseman Kris Letang attended the Steelers game Sunday and saw how Pittsburgh fans react to losing. He obviously did not want to be included in a bad weekend with Chicago teams and ensured it did not happen by scoring two regulation goals in route to defeating the Chicago Blackhawks. The first period proved to be a game of back and forth with little action occurring. If you live in Pittsburgh, or were able to catch the Pirates game, I am sure you were partaking in a game of “back and forth” with the remote. The biggest occurrence was when Kris Letang, Chris Kunitz and superstar Sidney Crosby were all involved in a scuffle with members of the Blackhawks. No injuries occurred but Crosby knows exactly how to make us all need a drink and a therapist. Bryan Bickell scored twice for the Blackhawks in the second including a shorthanded goal occurring at 1:09 in the period. Pittsburgh had opportunities but could not capitalize against veteran goaltender Nikolai Khabibulin who made 31 stops. Kris Letang proved his contract value with a breakaway goal at 9:23 in the third and added a power play goal with 2:16 remaining in the final. The third was also a point for us to call our therapists, again, when Sidney Crosby got in a shoving match near the Blackhawks bench. He is obviously testing his health. The game went into a shoot-out where rookie goalie Jeff Zatkoff was perfect, stopping all shots faced. James Neal and Sidney Crosby won it for the Pens. The most impressive player of the evening was Zatkoff, stopping 30 of the 32 shots he faced. Zatkoff stated "I've waited my whole life to start an NHL game" and he did not disappoint. I think if this was a regular season game I would have been equally as happy with the performance. He showed athleticism and made some highlight reel saves. The Penguins will wrap up their preseason Wednesday when they visit the Detriot Red Wings at 7:30 PM.